Zeta Phi Beta Charm Bangle Bracelet. Blue gumdrop gem charm. 7.5" stainless steel bracelet. Can expand out by 1". Zeta Phi Beta Sorority Bracelet- Blue/Silver- New! 5 out of 5 stars - Zeta Phi Beta Sorority Bracelet- Blue/Silver- New! 1 product rating1 product ratings - Zeta Phi Beta Sorority Bracelet- Blue/Silver- New! Zeta Bracelet. 10mm White glass pearl beads. Not tight. Bracelet conforms to wearer's wrist. The bracelet's stretch technology allows the wearer easy on/off access. U-Shape plush travel neck pillow filled with thousands of cushy micro-beads to provide ultra-plush support that correctly aligns your neck and spine, while supporting your head in soft comfort. Inside Material: 100% Polyester. Zeta Phi Beta Sorority Line Jacket- Royal Blue- Size Large- New! Left side- embroidered English spelling with crest. Organization colors. Right side- 3 Greek letters with embroidered English spelling. Zeta Phi Beta Sorority Line Jacket- Black- Size Large-New! Left side- Sorority crest. Organization colors. Right side- 3 Greek letters with embroidered English spelling. Zeta Phi Beta Sorority Polyester Scarf -New! 100% polyester satin scarf. Details as shown. Zeta Phi Beta Sorority Multi-Color Ankle Socks- Blue/White-New! Details as shown. Fits sizes- 5-10. Zeta Phi Beta Sorority Knee High Socks- New! Zeta Phi BetaFull Button Jersey. Black sizes available are:M, L, XL, 2XL. 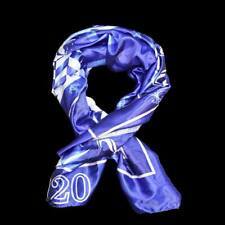 Wear your Blue and White pride on your wrist for everyone to see! ZETA PHI BETA wristbands! White bands with blue detailing including the dove with two "sistas" head busts. These wristbands make excellent gifts for yourself and sorors! Zeta Phi Beta Sorority Founding Year License Plate Frame- Silver/Blue- New! New travel bag with 2 straps and waterproof! Zeta Phi Beta Sorority Legacy License Plate Frame- Silver/Blue-New! Legacy at the bottom. Silver background with blue letters. Zeta Phi Beta Sorority Emblem- 2 7/8 Inches- New! Great crossing over gift or keep it as a collectible. 3 Clear Rhinestone. 7 Mixed Rhinestone. Zeta Phi Beta Sorority Finer Womanhood License Plate Frame-Blue/Silver-New! Blue background with silver letters. Fits any car, van or truck. Zeta Phi Beta Sorority Auto Open Folding Umbrella-New! Heavy duty rubber handle and matching sleeve. Zeta Phi Beta Sorority Lanyard Key chain-New! 1" wide cloth lanyard with embroidered English spelling, Greek letters, and founding year in organization colors. Detachable key fob. Zeta Phi Beta New Crest Car Emblem- New! Heavy duty 3M sticky pad on back for permanent application.